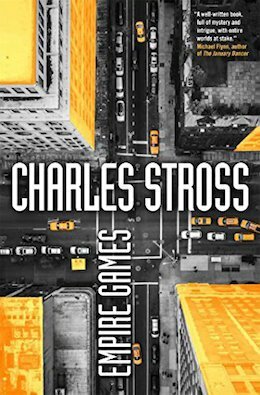 I have a somewhat complicated relationship with Charles Stross. The stories and novels of his which are most renowned and most awarded are the stories and novels of his which I have least been able to appreciate or connect with. The works which are less recognized for awards like The Laundry Files and The Merchant Princes are ones which, at the basest level, I have been able to even enjoy, though looking back through my reviews of the first five Merchant Princes novels I see that I was much more conflicted about them as well, that it is time and distance which has softened my views - and perhaps it is this which had me forgetting some of what I struggled with and instead remembering the aspects of the novels I loved. I've always loved the concept of parallel universes, and how Stross handles that idea in The Merchant Princes had me sold from the first book (even when other aspects of the book did not). I wanted to know how the various worlds that Miriam Beckstein could access by staring at an intricate knot were connected, and it turned out that she was a lost scion of a world walking family from a separate timeline from our own. Throughout the series we see how the two original timelines interact, how everything escalates, and overall, Stross takes the reader on a heck of a ride. It has been seven years since Stross completed his six volume Merchant Princes series (or three volume series if you discovered the Merchant Princes when it was reissued in the longer volumes Stross originally intended) and in the chronology of the novels it has been seventeen years since the conclusion of The Trade of Queens when after rogue worldwalkers detonated a nuclear bomb in Washington DC, killing the President, the United States retaliated with a nuclear strike on the Gruinmarkt in that other timeline. There were more stories to tell in that setting and the only question was whether or not Charles Stross would tell them. Empire Games picks up seventeen years later with Miriam Burgeson (formerly Miriam Beckstein) and others from that now uninhabitable world / timeline escaped to a third timeline the United States government does not yet know about - but Miriam knows that the United States has not forgotten and will one day catch her operatives and find their way to what we're calling Timeline Three. Unlike the original Merchant Princes series, Miriam is not the protagonist here. Stross weaves multiple perspectives throughout multiple timelines, but the true focus of the novel is a young woman named Rita. It matters, but doesn't fully matter throughout Empire Games, that Rita is the daughter or Miriam that Miriam gave up for adoption prior to the opening of the first Merchant Princes novel. It means that Rita has the potential for worldwalking between timelines and the Department of Homeland Security has been watching Rita from the moment they learned about the Clan and the Clan's breeding program back in the United States. Empire Games serves very well both as a continuation of the Merchant Princes as well as an entry point for new readers. 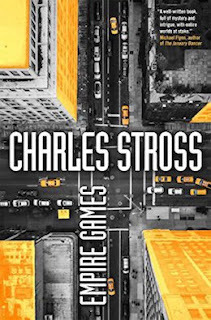 Stross has set this up with enough introductory material that readers unfamiliar with the series will be brought up to speed with the high points of what occurred in the first six books and readers who last read Trade of Queens seven years ago will be refreshed. One of the strongest things about Stross's strongest fiction has been the ideas. There's so much cool and interesting stuff here. As I mentioned, I'm a sucker for alternate universes / multiple timelines, but Stross has also introduced the idea of the "forerunners" a significantly more technologically advanced society from another timeline that has disappeared. He has also introduced some interesting ideas about the origins of the Clan, and none of this is the most significant part of Empire Games. If it is extra important, it's stuff that will come later in the next two books (if then). Where Empire Games is better than anticipated is that the level of Stross's writing is actually beginning to rise to the level of his ideas. This was most notable in the previous Merchant Princes novels where the writing was just barely serviceable enough to keep pace with how fascinating the creation of this world walking conflict was (and, in some cases, and active detriment). That's not the case in Empire Games. Here nothing distracts from all the cool stuff going on, and though it perhaps take a little bit longer than desired to get to the worldwalking - but once Stross gets there, Empire Games really takes off and is one hell of a ride. Bonuses: +1 for the deep background worldbuilding of the political changes of Timeline Three, the forerunners, and the glimpses into the stuff behind the story that may never take center stage in subsequent novels.